Developed by Maharaja Umaid Singh in 1933, the resplendently good-looking Sardar Samand Lake is 60 km from Jodhpur. The drive to the lake is as attractive as the lake itself. Black Bucks, Neelgais and Chinkaras constitute the wildlife of the region and can be often spotted throughout the drive. The smiling folks of the Bishnoi villages are a pleasure to see. Bishnois are known for their passion to conserve the plant and animal life alike. The tranquility and quiet serenity of the place not only beckons the tourists but also a big variety of migratory birds that form a delightful plumage to watch. The chic art-deco summer palace of Maharaja Umaid Singh, the Sardar Samand Lake Resort, which once served as the hunting lodge of the Jodhpur loyalty, stands proudly on its banks. The rambling grounds and gardens of the resort offer enchanting walks and breathtaking views of the grandiose shimmering waters of the lake.Near the lake stands classy art-deco summer palace of Maharaja Umaid Singh, the Sardar Samand Lake Resort - yet another feather in the cap of Welcome-Heritage Group. The lake resort affords one of the most breathtaking views of the magnificent lake. A hunting lodge of the royal Jodhpur family, the palace is situated on a hill overlooking the huge Sardar Samand Lake. All original features of the resort have been retained and the sprawling grounds and gardens offer delightful walks. 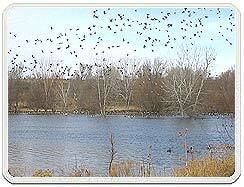 Overlooking the large lake teeming with numerous birds, the place is a virtual aviary.